Ibiza is the third largest of the Balearic Islands, covering just 225 square miles (585 square km), but in recent times it has become the best known of the archipelago and a hugely popular destination for young revellers, middle-class European package tourists, and gay travellers, whose collective character imbue the island with a chic and trendy atmosphere that is well expressed by its famously frenetic nightlife. Ibiza has plenty to offer besides nightclubs - its jagged coastline contains dozens of dreamy white sandy beaches, hidden coves and bays, villages of white-washed houses tumbling down cliff sides, and a green, hilly interior landscape decorated with fig and olive trees. The island's main town is the port of Ciudad de Ibiza, known as Eivissa to the locals and Ibiza Town to the Brits. Located in the south, it is the centre of the island's nightclub scene and has a lively marina and quaint old quarter with some great restaurants. It lies close to the beautiful beaches of Figueretes, Es Cavallet, and Ses Salines. San Antonio is the main resort town of the island and is somewhat blighted by high-rise hotels and apartment blocks, though it is making efforts to clean up its slightly tarnished image and its popularity is still legendary. The main attractions for many British holidaymakers are the two clubs of Es Paradis and Eden but there are also some beautiful coves nearby with glorious beaches. It's best to get there early in the summer months to reserve a spot. Just three miles (5km) offshore is the 'satellite' island of Formentera, a little haven reached by ferry, with less crowded stretches even in the height of the sweltering summer season. 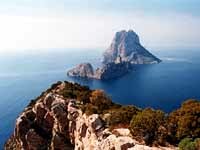 There is good public transport between Ibiza Town and San Antonio, and to and from the main beaches and resorts. Taxis are good value and the best way to get around in the evening, although there is also a 'disco bus', travelling from San Antonio to the main clubs in Ibiza Town during the peak season. Cars and scooters can be hired by the day or week for those wanting to explore the island. Ferries run from San Antonio and Ibiza Town to nearby beaches between May and October.